Russia will test a new spacecraft docking system at the International Space Station tonight (July 23), one that will be used on future robotic and manned missions to the orbiting outpost. The test is being performed by the unmanned Russian cargo ship Progress 47, which undocked from the space station on Sunday (July 22) to prepare for the docking demonstration. 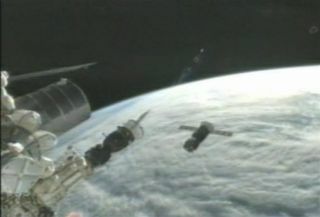 The Progress 47 cargo freighter arrived at the station in April, and had been attached to the Pirs compartment on the Russian segment of the orbiting complex. Tonight, Russian flight controllers will command the Progress to approach the station and re-dock using a new automated system, called Kurs-NA, which is an updated version of the Kurs system that has been used for years by Progress and Soyuz spacecraft. The Progress 47 cargo ship is expected to re-attach to the station at around 9:57 p.m. EDT (0157 GMT July 24). The Kurs-NA docking system will feature updated electronics, and is expected to use less power and improve safety, NASA officials explained in a statement. NASA Television will broadcast live coverage of the docking demonstration, beginning tonight at 9:15 p.m. EDT (0115 GMT July 24). NASA TV can be viewed here: http://www.nasa.gov/ntv. The Progress 47 cargo ship arrived at the International Space Station in April, delivering food, clothing and other supplies for the crew living aboard the orbiting outpost. After the cargo was emptied, the station crew filled the spacecraft with trash and other discarded items. The disposable Russian Progress ships are intentionally sent to burn up in the Earth's atmosphere at the end of their missions. The Progress 47 is scheduled to make its final departure from the space station on July 30 at 2:11 p.m. EDT (1811 GMT). The next Russian cargo ship, Progress 48, is slated to launch on Aug. 1 from the Baikonur Cosmodrome in Kazakhstan. In the meantime, another unmanned cargo freighter is scheduled to arrive at the International Space Station. After a week-long journey in orbit, a robotic Japanese vehicle, called the H-2 Transfer Vehicle-3 or HTV-3, will reach the station. Astronauts aboard the orbiting complex will use the station's robotic arm to pluck the cargo ship from space and manually attach it to the Earth-facing side of the Harmony module. The HTV-3, which is also called the Kounotori 3 (Japanese for "White Stork 3"), was launched toward the International Space Station on July 20 from the Tanegashima Space Center in southern Japan.